Cut the gourd into halves (lengthwise). Remove the seeds with a spoon. Make sure you get rid of all the seeds, otherwise the dish will be super bitter. Slice the flesh of the gourd into pieces (approximately 0.5cm thick). Wash the gourd with water. Add the water into the pot, wait until the water has boiled, then add the 1-2 tsp of salt into the water. Add the gourd pieces into the boiled salt water. Leave them there for approximately 10 mins to get rid of the bitterness. Meanwhile, heat the pan and add about 3 tbsp of cooking oil into the pan. Crack 3-4 eggs into the pan and use the spatula to scramble them. Transfer the scrambled egg into the plate when they are 80% cooked. Add about 1-2 tbsp of cooking oil and add 2 tsp of sliced garlic into the pan. Stir-fry the sliced garlic for 2-3 mins. Drain the boiled gourd, then add them into the pan. Add the scrambled egg and stir-fry for 30 seconds. Add 1 tbsp of oyster sauce, 1 tsp of fish sauce, and ½ tsp of light soy sauce and stir-fry (making sure the sauces are evenly spread out). Add ¼ tsp of grounded pepper and ½ tsp of sugar into the pan. Stir-fry again (making sure the seasonings are evenly spread). 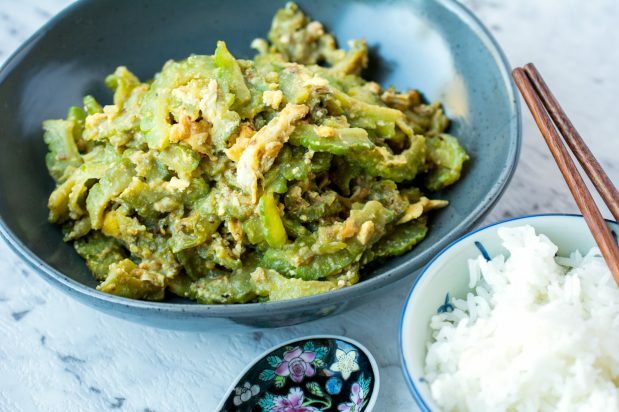 Transfer the stir-fried bitter gourd with egg onto the serving plate.